A raised deck is perfect for creating a social area in your backyard. Adorned with garden furniture and accessories, it can even raise your property’s value. That being said, building a raised deck can be an expensive investment. An affordable solution is buying a decking kit and building it yourself. Coming in a wide range of sizes, it’s easy to find the right kit for any property. Size aside, there are other things to consider though. From the timber to the quality of the fixings and everything in-between, you must make sure the product you buy will live up to your expectations. If you’re unsure which kit to choose, check out our top picks below, tested and rated by industry experts. Our #1 pick – creates a superb outdoor space perfect for relaxing or entertaining in the summer. 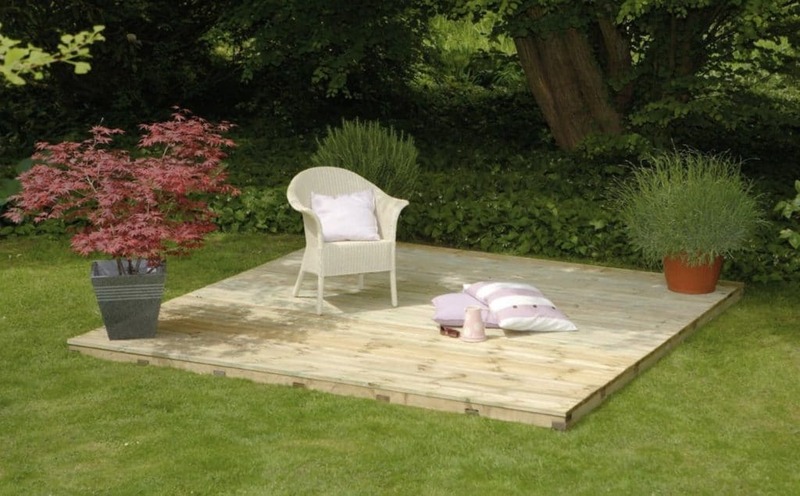 A high-quality yet cheap decking kit perfect for starters and homeowners shopping on a budget. Sophisticated solar decking lights come with integrated solar panel for a no-fuss installation. Six ultra-bright LED lights can seamlessly highlight the beauty of your decking, garden edging, or patio. Twelve separate solar decking lights are ideal for creating a focal point during the night time. 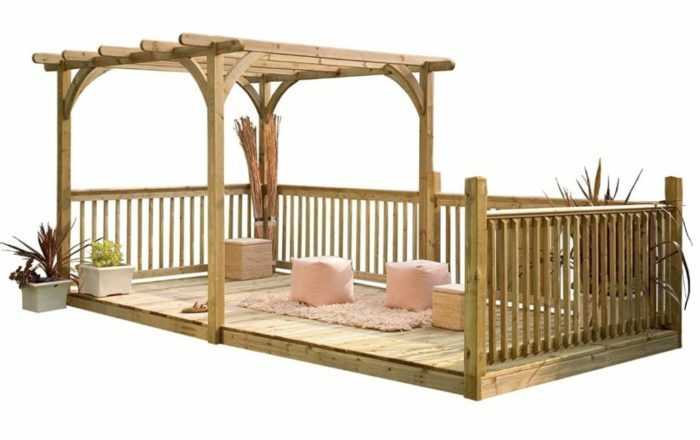 Kit includes an integrated pergola that’s perfect for climbing plants. Forest Ultima is a patio and pergola kit ideal for creating an ultimate outdoor area. Supplied with full fixings and comprehensive instructions, it can be laid directly onto existing patios or other flat surfaces, but also on ground-soil or grass. A great choice for larger gardens, the decking planks are made from planed timber for a smooth finish. We also liked the generous base that provides plenty of space for rattan furniture, flower pots and garden accessories. One of the greatest features is the integrated pergola, perfect for climbing plants and flowers. The unpainted pressure treated timber maintains the natural beauty of the wood and matches most exteriors. That being said, you can still easily give your area a new lease of life with a darker wood stain or coloured decking paint. Strong and robust, this kit is ideal for your outdoor socialising or dinner area, for a hot tub, or to use as an extension of your existing patio. Sustainably sourced timber is certified by the Forest Stewardship Council and comes from properly managed forests. Wide base provides plenty of room for garden furniture or a hot tub. It measures 2.5 x 4.8 metres. 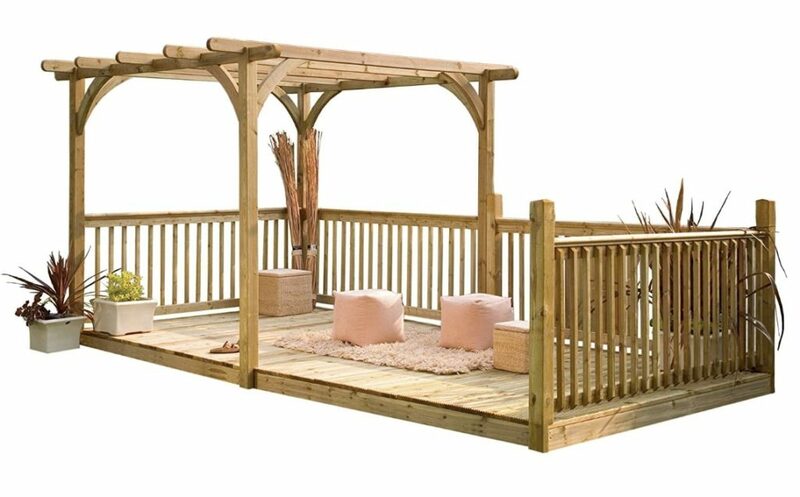 Kit includes decking, side rails, an integral built-in pergola and all fixings. Too large for smaller backyards. Some homeowners felt the joist planks are too thin. A budget-friendly decking kit ideal for most backyards. Whether you have a small backyard or you’re looking for an affordable decking kit to test your DIY skills, Ruby Starter could be the ideal match. This kit is one of the cheapest on the market, but is still made-up of some really high quality components. Like most decking kits, it comes with everything needed for installation. Designed to create a square decked area, the kit includes 22 decking boards and six joist planks, all made from FSC certified wood. A thicker profile ensures both extreme durability and low maintenance, with a life expectancy of around 15 years. This is possible due to the kiln dried, machined engineered, and pressure treated timber that has been sealed with water repellent wax. The treatment not only ensures durability, it also gives a beautiful finish that highlights the natural colour and grains of wood. We also like the smooth finish and the strength of the joists. Undoubtedly, this kit provides excellent value for money. Pressure treated timber requires no further treatment other than maintenance, but can be stained or coloured with specific outdoor wood products. Easy to build. Kit includes all decking screws and comprehensive instructions. Base measures 1.8 x 1.8 metres. Perfect for inexperienced DIYers and yards of all sizes. Two or more packs can be joined together to build a larger area. Planks are not predrilled, making installation a little more complex for first-timers. Cost-effective decking kit for a small to mid-size yard. 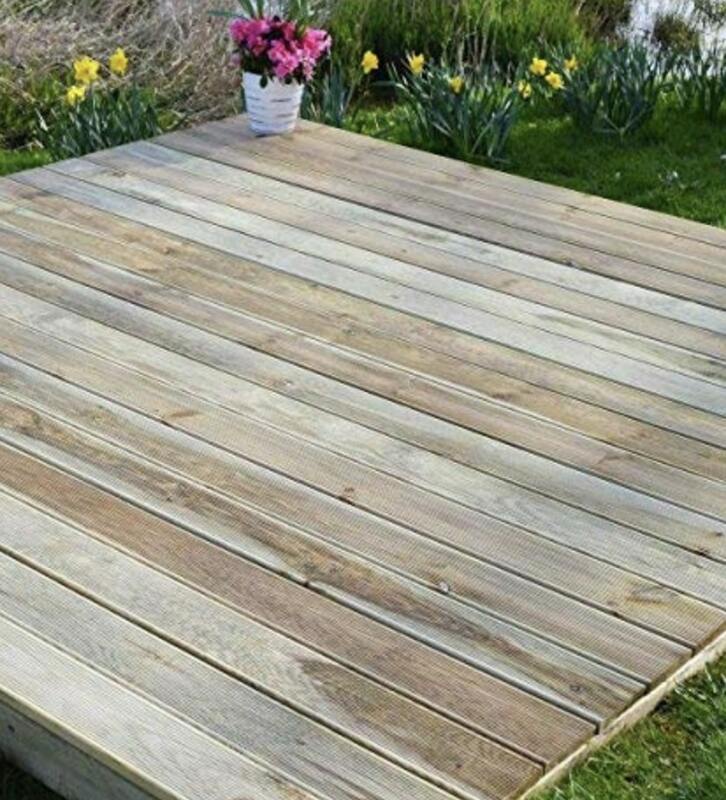 Very similar in stature to our best value pick, this decking kit is ideal for a slightly bigger property but still compact enough to fit well in a smaller garden. Covering an area of 2.4 x 2.4 metres, the kit is comprised of everything needed for installation right out of the box. It comes not only with decking boards and screws but also with a roll of weed membrane, decking nails, and a framework designed for easy mounting on uneven surfaces. You only need the tools and skills to put everything together. Like our other choices, the materials involved are praised for their durability. However, the quality of the timber is slightly lower, and the manufacturer doesn’t state where the wood is sourced from. Despite occasional knots, this product is of good quality overall and with the right maintenance, it will last for years to come. 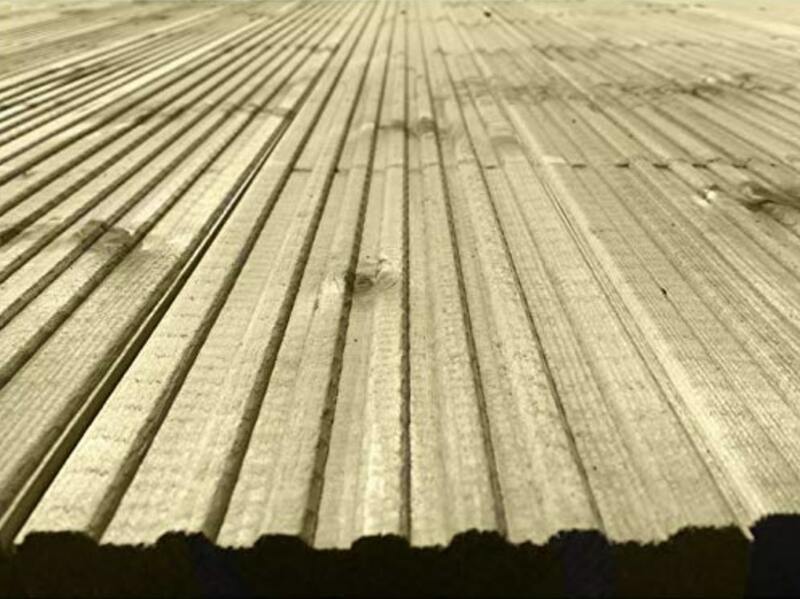 As you would expect, all timber boards and planks are pressure treated and cut to length. Standard kit includes smooth planed boards and planks; it is also available in a variant with ribbed boards. All kits are customisable to the desired size. DIY decking kit is very easy to install and is supplied with all fixings and accessories. This kit doesn’t include decking rails or border panels. However, they can be ordered at a supplementary cost. Shipping is restricted to UK mainland. Full decking kit boasts a simple and easy installation. Ruby Garden Deck Kit with complete base covers a surface area of 9 square metres and is ideal for a larger garden or yard. Manufactured with the average homeowner in mind, the decking is straightforward to mount and requires minimal DIY experience. The timber included is FSC certified and comes from sustainable sources. Unlike other kits on the market, this one comes with robust decking boards and thick joists guaranteed to last for years. Furthermore, the timber is guaranteed for 15 years but it can last longer with the right maintenance. All wood included in this kit is pressure treated and impregnated with water repellent wax that doesn’t alter the natural colour of wood. Obviously, you can stain or paint the decking area in any desired colour. Regardless of your choice, the smooth finish with slightly rounded edges will still offer a stylish touch to your property. A long-life expectancy and low maintenance requirements ensure peace of mind and hassle-free enjoyment. Kiln dried, smooth planed joists provide a strong base and construction-grade quality. Decking kit comes with all fixtures and fittings needed for a quick installation. Although it is very easy to figure out how to mount the deck, the kit includes no clear instructions. Versatile and cost-effective decking kit that’s perfect for most homes. 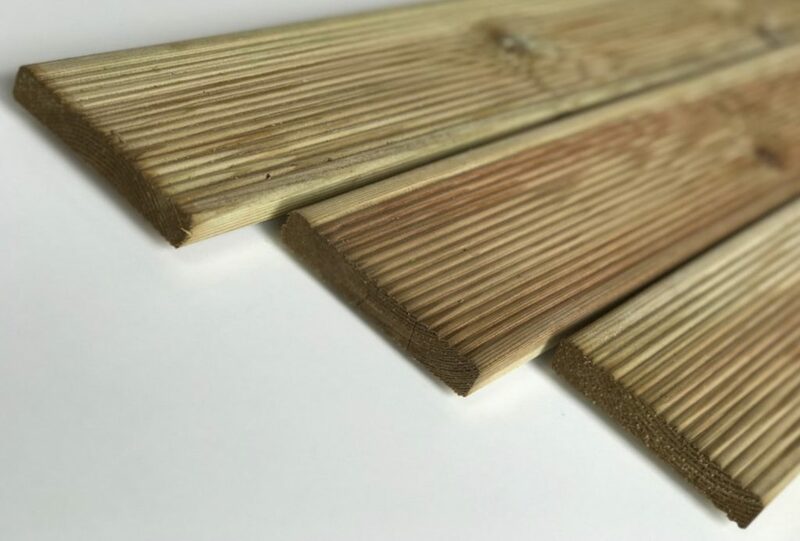 Savoy Timber offers a versatile decking kit ideal for an area of 3 x 2.4 metres. It is similar in many ways to our selections above but comes with an interesting twist. The decking boards included present a smooth planed finish on one side and slightly rippled finish on the other. Thanks to this innovative solution, you can choose your preferred finish by simply installing the boards with the desired side face-up. Besides finish choices, we also appreciated the installation ease. Savoy Timber’s kit comprises everything needed for a quick and easy build, including fixings and an instructions booklet. Both the decking boards and framing planks are made from responsibly sourced pressure treated softwood. Treatment is not required unless you want to stain or colour the wood. Maintenance is also minimal, and this decking will undoubtedly last for a seriously long time. Complete kit comes with everything needed for DIY installation, including mounting instructions. Pressure treated wood is FSC certified and is protected against wood decay and insect attacks. Dual sided boards make for a versatile solution. Kit includes no handrails; if they are a must, a separate kit is available at a reasonable cost. Decking kits offer a versatile garden deck solution to newer DIYers. Their main advantage is improved time management. You won’t need to go out searching for the perfect timber boards. You can also skip any woodworking, as you won’t have to cut the boards to size. A decking kit comes with everything you need for hassle-free, out-of-the-box installation. Most solutions available on the market also include all necessary fixtures and fittings, for even quicker results. Besides any subjective considerations, when choosing a deck kit you need to consider its size and the materials involved. There are few limits when it comes to sizing. You can choose from a wide range of dimensions and even join two or more packs together to create a larger decking area if needed. You also have quite a few material choices. Most manufacturers use pressure treated softwood, but hardwood and composite kits are also available. However, softwood tends to be the cheapest and, if treated and maintained well, it will still last for many years. You can skip this step if you’re installing the decking onto another hard surface. However, if you want to build it on a lawn or directly over soil, it may be necessary to level the surface and get rid of any plants. Remove all vegetation from the area where you want to place your structure and apply a herbicide solution. Level the ground as best you can and cover the area with weed membrane. Make sure the rows of membrane overlap to prevent the growth of grass or weeds under the deck. Follow the manufacturer’s instructions to install your kit. Some manufacturers include pre-drilled boards and planks, others will require you to drill them yourself. See our decking installation guide for in-depth details. Start by laying out the joists, before screwing or nailing all planks to create a solid foundation for the timber boards. Place the foundation in the desired position and fix it to the ground. Position the first decking board on one end of the frame and fix it in place with screws or nails. Continue with all other boards until your decking is completely covered. Another optional step is staining or painting your new boards. Most kits come with pressure treated timber that is water repellent and will resist wood decay. However, if you don’t like the natural colour of the wood, you can stain or paint it in a colour of your choice. Use a specific decking product or one meant for outdoor wood and follow the manufacturer’s instructions for application. Let it dry, then populate your new outdoor area with garden furniture and accessories. That’s it. You can now enjoy your brand new structure!